This article continues the running timeline of events surrounding Shawn McCraney’s departure from mainstream Christian orthodoxy into error and heresy which was comprised Part 1 of this series. While the reader is encouraged to read through the previous timeline from the beginning (which can be found by clicking here) to gain a fuller historical context, the events, issues and actions outlined here, I believe, speak for themselves. After a long hiatus Shawn McCraney resumed teaching on the nature of God. While prior lectures were primarily on God the Father and Christ, this lecture focused on the Holy Spirit – who Mr. McCraney asserts isn’t a person due to certain gender neutral Greek words that are used in the original languages that our English Bible is translated from. Now I know for a fact that Charles Colson would most certainly not agree with what Shawn taught about the Holy Spirit tonight or how he’s behaving in his ministry. In fact, having read quite a bit of Colson’s work over the years it’s easy to imagine him telling Shawn that he’s ignorant, confused, and in need of some quality training and discipling before he does any more damage by errantly and heretically teaching Christian doctrine. And I doubt that even the pantheistic humanist Goethe** or the agnostic humanist Jorge Luis Borges*** would agree with much, if anything, that Shawn taught in this show either. Rather, they would reject it if nothing more than for the fact that his reasoning and logic is so blatantly flawed and fallacious. Further, Shawn abused every source that he cited in support of his position. I can safely say that every Christian source that Shawn cited in his lecture would tell him that he’s in error, teaching heresy regarding the nature of God, and drawing wrong conclusions based on their work based on his own confirmation bias – or, if you prefer, prejudice. No, Mr. Craney those of us who are publicly criticizing your work aren’t perfect but neither are we close minded. We’re challenging and denouncing what you’re teaching not out of prejudice or because we’re proud but because what you’re saying simply doesn’t stand up to scrutiny. So feel free to rally your followers behind manipulative pull quotes if you wish, however, if I were you, I would pay more attention to those four fingers that are pointing back at you – they’re trying to tell you something. * Shawn taught that the Holy Spirit isn’t a person separate and distinct from God the Father and God the Son. One potential argument that the Holy Spirit is a person is to look at the Greek words in John 14:26, 15:26, and 16:13-14. There we see that the antecedent of the masculine ἐκεῖνος (a masculine word for “that person”) is πνεῦμα (a neuter word for “Spirit”). Hence, so the argument goes, the Spirit is a person. Unfortunately, that argument likely doesn’t stand up to scrutiny. A more fruitful approach is first to ask a question almost no one asks: how do we know that the Father is a person? How about the Son? 4. The Spirit can be grieved. 5. The Spirit can be outraged. 6. The Spirit can be lied to. 7. The Spirit can forbid or prevent human speech and plans. 8. The Spirit searches everything and comprehends God’s thoughts. 9. The Spirit apportions spiritual gifts. 10. The Spirit helps us, intercedes for us, and has a mind. 11. The Spirit bears witness to believers about their adoption. 12. The Spirit bears witness to Christ. 13. The Spirit glorifies Christ, takes what is Christ, and declares it to believers. I’m sure that are equally good – possibly superior – articles on this subject, but this one is short, sweet and to the point. It’s also fully supported by scripture. I challenge Shawn to address the issues raised in this article on his next show. I watched Shawn McCraney’s broadcast from Tuesday, April 22, in which he laid out several objections to the Trinitarian view of the Holy Spirit as a person. I sent Shawn an email in response the next day. Having not heard from Shawn, and having not received any response from him to my previous efforts to offer constructive criticism, I am sharing here what I said to him in that email. I will present my response in three posts here. I have been waiting for Shawn’s lecture on the Holy Spirit for weeks, because I fully expected that he would have greater difficulty with the doctrine of the Holy Spirit due to the fact that there is no Incarnation involved. That is, I expected that he would have greater difficulty maintaining some sort of distinction involving the Holy Spirit while rejecting the doctrine of the Trinity. I was correct. Since during the broadcast he explicitly mentioned me as a scholar who might offer him some insight or correction on at least one point he made, I gave him plenty to consider. Let me begin by quoting my summary of his lecture on March 18 (which I posted here on Facebook). Sorry I don’t have a transcript of his remarks, but I think this is a fair summary of what he said then. Now, the above doctrine was problematic enough, but at least in some of what Shawn said one could optimistically hope that he viewed the Father, Son, and Holy Spirit as genuinely distinct, as each someone in relationship with the other two, and therefore as largely orthodox in substance even if he rejects orthodox theological terms. At one point in that broadcast he even referred to the Father, Son, and Holy Spirit as “three persons,” though only after creation, not before it. However, in his most recent lecture he moved even further away from orthodox doctrine (and, I emphasize, biblical doctrine, as I shall explain). The Holy Spirit, he claimed, is simply God’s power or presence, an “it,” just a way of describing God expressing his presence or power. He claimed this to be true in both the Old and New Testaments. Sadly, there is no way this can be salvaged as anything but heretical. In my next two posts, I will address the other arguments he presented. A third argument Shawn presented was an objection to the use of the definite article “the” in English translations with the title “Holy Spirit.” He asserted that the article is “often added by translators, leading the reader to think that ‘the Holy Spirit’ is referring to a separate person.” Well, there are many places where the Greek has the article in front of the words for “Holy Spirit,” such as Matthew 28:19 (TOU hAGIOU PNEUMATOS), Mark 3:29 (TO PNEUMA TO hAGION), John 14:26 (TO PNEUMA TO hAGION), and quite a few others. (TOU and TO are both forms of the Greek article.) I assume Shawn would agree with me that the Greek writers of these books were not misleading readers by using the article. The fact is that Greek uses the article in a different way than English does. We normally use the article in front of what we call titles (the Father, the Messiah, the Lord, the king, etc.) but not in front of what we call proper names (Jesus, Peter, Shawn, Rob). Greek doesn’t work that way. Proper names and titles in Greek can occur with or without the article; usage is quite complicated and sometimes little more than a matter of style. The expression “in Christ” in Paul usually does not have the article (EN CHRISTW), but of course this doesn’t mean that Christ is something other than a person. And sometimes Paul writes “in the Christ” (EN TW CHRISTW), but English versions nearly always omit the article (1 Cor. 15:22; 2 Cor. 2:14; Eph. 1:10, 12, 20). Shawn also argued that if translators had simply used impersonal pronouns to translate the neuter pronouns referring to the Spirit (it, its, itself, etc. ), “the case for the personality of the Holy Spirit, the person, would largely disappear from Christian belief.” That is true only of the most superficial popular way that contemporary English-speaking Christians try to defend the personhood of the Holy Spirit. The KJV often used neuter pronouns when the Greek pronoun was neuter, and the KJV translators and their readers were all Trinitarians. They had no trouble seeing the person of the Holy Spirit in the Bible. Finally, Shawn suggested that it is only “a few comparative difficult verses in the Gospel of John” that seem to refer to the Holy Spirit as a person, and he stated somewhat disparagingly that “those verses are used over and over again to prove that the Spirit is a person.” Later he suggested these could be explained away as personifications, like wisdom in Proverbs 8. But Jesus was not speaking in poetry in John 14-16, and the same things that Jesus says about the Spirit in John 14-16 are said about Jesus himself in the same book. For example, the noun PARAKLETOS clearly refers to a person, and Jesus refers to the Holy Spirit as “another PARAKLETOS” (John 14:16), meaning another besides himself. In his epistle, John – the same author as the Gospel of John, of course – refers explicitly to Jesus Christ as our PARAKLETOS (1 John 2:1). PARAKLETOS is not a noun that just happens to be masculine but that normally refers to something impersonal, like _la bicicleta_ (“the bicycle”) happens to be feminine. PARAKLETOS is a personal noun, denoting someone who provides support, assistance, counsel, agency, mediation, or the like. If Shawn wished to claim that the noun doesn’t refer to the Spirit as a person, this would be something he would need to show exegetically from the context, which he has not done. Perhaps it should be noted in closing that the doctrine that the Holy Spirit isn’t a person is only held to by Christian Cults such as the Jehovah’s Witnesses, Unitarians, Oneness followers, Hebrew Roots, Christadelphians, The Way and other Anti-Trinitarian groups. 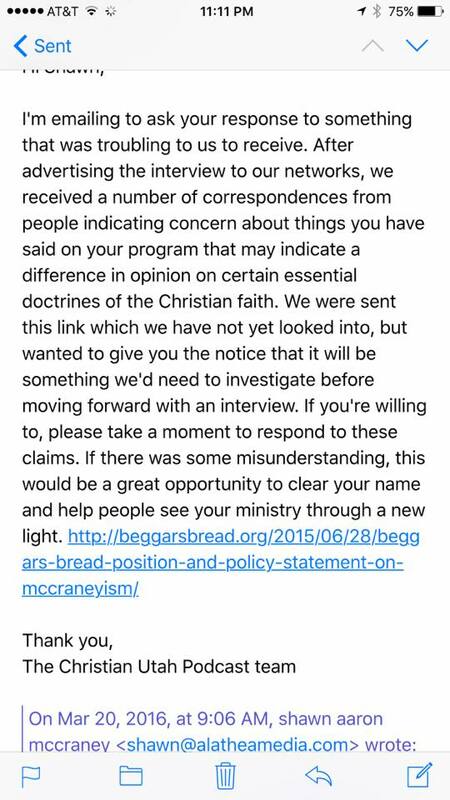 This is hardly an encouraging sign for those of us who are hoping and praying that Shawn McCraney will find his way back to Biblical orthodoxy and bring those that he has led astray through such false teaching along with him. Further, engaging in censorship of critics and those who are trying to help him find that way back is certainly an unwelcome trend – and one that’s odd for someone who has been so free in his condemnation and criticism of the LdS Church for engaging in such tactics with their critics. We will continue to monitor the situation with Shawn McCraney and will add updates to this article as noteworthy events unfold. Shawn McCraney states emphatically the Holy Spirit isn’t a person separate and distinct from God the Father and God the Son and reiterates his rejection of the Trinity. Shawn also explains the reasoning behind shutting down the “Heart of the Matter with Shawn McCraney” page on Facebook. This episode is also unique in that it is the first Heart of the Matter YouTube posting with comments disabled on the page. Shawn McCraney (“Heart of the Matter”) concluded his series of lectures against the doctrine of the Trinity a couple of hours ago (though I wouldn’t be surprised if it comes up again). He gave a list of arguments against the personhood of the Holy Spirit. I won’t go through them all right now. However, I will point out that many of Shawn’s arguments against the personhood of the Holy Spirit, if applied consistently, would also “disprove” that God the Father is a person, or that Christ is a person. (a) Shawn makes a big deal of the fact that “Holy Spirit” is never capitalized in the Greek. Neither is “God,” “Christ,” “Jesus,” or “Father.” For that matter, neither is “Peter,” “Paul,” or “Mary” (sorry, couldn’t resist). Ancient Greek manuscripts were written with all block letters, and later a cursive form developed that used what we call lower-case letters. But in biblical times, there was no upper-case and lower-case lettering system. (b) Shawn points out that Christ and the Spirit are both called Parakletos; both are said to intercede for us (Rom. 8:26, 34); both are said to have been given to us by God. How these things prove that the Holy Spirit is not a person, I don’t know. If anything they might seem to prove that the Holy Spirit is Jesus. (They don’t. For example, John 14:16 calls the Holy Spirit “ANOTHER Parakletos,” making it clear that the Holy Spirit is not Jesus but is someone like him.) But Shawn doesn’t (usually) make that claim. At one point, though, Shawn cites 2 Corinthians 3:17-18 and concludes that it means that Jesus is the Spirit. If so, then, by Shawn’s own reasoning, either Jesus is not a person or the Holy Spirit is a person. (c) Shawn repeated his argument from the previous week that the Holy Spirit is called the power of God in Luke 1:35. This is not correct, but if it were, it should be noted that the Bible calls God “the power of God” (Luke 22:69) and refers to Christ as “the power of God” (1 Cor. 1:24). So by Shawn’s reasoning, God and Christ are not persons. (d) Also last week, Shawn had argued that the Holy Spirit is not a person because the Bible uses a neuter noun, PNEUMA, and neuter pronouns in reference to the Holy Spirit. However, the Bible also uses the neuter noun PAIDION (“child”) and neuter pronouns in reference to Jesus. Jesus is called a PAIDION eleven times in the New Testament (Matt. 2:8, 9, 11, 13 [2x], 14, 20 [2x]; Luke 2:17, 27, 40), all in reference to the period of several years after his birth. Matthew uses the neuter pronoun auto in reference to “the child” Jesus: “Rise, take the child [PAIDION] and his mother, and flee to Egypt, and remain there until I tell you, for Herod is about to search for the child, to destroy him” (Matt. 2:13 ESV). Here the ESV uses “him” to translate the Greek pronoun AUTO (as does the KJV also). Luke uses the same pronoun AUTO in reference to Jesus as PAIDION twice (Luke 2:28, 40). So once again, by Shawn’s reasoning, Jesus, at least when he was a child, was not a person. The tragedy is that all of these errors could easily have been avoided, if Shawn would have listened to sound teachers and studied these things carefully before publicly teaching on matters he doesn’t understand. In response to a caller’s question last night about Matthew 28:19, Shawn McCraney resorted to the claim that the fourth-century writer Eusebius supposedly testified to an original form of the text in which Jesus said to baptize disciples “in my name” instead of what we find in all of the Greek manuscripts. Many anti-Trinitarians continue to repeat this claim today, though it is difficult to find contemporary exegetical commentators or textual critics who will support it. Eusebius quotes the triadic phrase in full five times when quoting Matthew 28:19; the one place he doesn’t is simply a paraphrase, not a full quotation. The triadic phrase is found in all Greek manuscripts of Matthew that contain the passage and is attested in several second-century Christian writings. For a critical scholarly refutation of the abuse of Eusebius, see Benjamin Jerome Hubbard, _The Matthean Redaction of a Primitive Apostolic Commissioning: An Exegesis of Matthew 28:16-20_, SBL Dissertation Series 19 (Missoula, MT: Society of Biblical Literature, 1974), 151-75. Prior to his weekly Heart of the Matter lecture Shawn McCraney offers an Anti-Trinitarian critique of Matthew 28:19 claiming that it is a deliberate post-Nicene Trinitarian manuscript corruption that didn’t appear in the original. That verse reads, “Go therefore and make disciples of all nations, baptizing them in the name of the Father and of the Son and of the Holy Spirit,” (ESV), and is theologically noteworthy as a direct apostolic affirmation of the Trinity by Matthew. The lecture that followed is difficult to summarize because it was such a jumble of mixed metaphors and ideas – it was essentially on how no one has the right to judge or criticize the theology of anyone who professes Christ or claim that they’re going to hell as a result of their doctrine or beliefs. He did this by starting with a full whiteboard of different groups (Catholics, Baptists, Pentecostals, Arminians, Calvinists, Seventh-day Adventists, Calvary Chapel, Latter-day Saints, etc.) all boarding the “Jesus Plane” that later crashes killing everyone on board. Shawn stated the answer to getting into heaven is through grace by having faith in Christ’s atonement which manifests itself in one’s life by exhibiting the kind of Christian love that Christ taught and practiced. Further, he insists that true Christianity manifests itself in the kind of love that wouldn’t throw or keep others off the Jesus Plane and wouldn’t criticize those that are on it. He went on to strongly imply that those who who insist on orthodoxy in theology and doctrine are false loving, hard hearted, pride filled, hypocritical, controlling, power hungry Pharisees who have no right to criticize the doctrine of the others on the plane – and are in fact, getting in the way of leading themselves and others to true, saving love. That is, their hearts aren’t right. But he then went to say that in coming weeks he will criticize and speak out against those that claim to be Christians but deviate from “what’s right according to the Bible” – like the LdS Church for example. This assertion was also reiterating during the call-in section of the show. At the end of his lecture he stated that the majority of those on the “Jesus Plane” are going to hell. But that’s OK because those who go to hell will be OK in the end because hell is much different than what others have taught about it in the past. He promised to explain this more fully in the weeks to come. This author is persuaded that much of this lecture was yet another attempt by Shawn to silence his critics – this was more apparent in the tone, timbre, snide comments, and attitudes in the lecture than the content alone. The reader is encouraged to watch the lecture yourself and determine if the author’s assessment is accurate or not. On May 6, Shawn McCraney reiterated more emphatically his acceptance of the anti-Trinitarian claim that Matthew 28:19 did not originally say “baptizing them in the name of the Father and of the Son and of the Holy Spirit.” According to this argument, Matthew 28:19 originally said “baptizing them in my name,” and the text was changed by the Trinitarians in the fourth century following the Council of Nicaea in 325. In support, Shawn offered two arguments that are commonly made. The first is that no NT Greek manuscript from prior to Nicaea contains the triadic wording in Matthew 28:19. The second point is that Eusebius of Caesarea often quoted Matthew 28:19 using the words “in my name,” and only began quoting it with the three names after Nicaea. As with most of his other arguments against the Trinity, Shawn is simply repeating arguments commonly made by anti-Trinitarians, especially in this case Unitarians and Oneness Pentecostals. It is true that no Greek manuscripts prior to Nicaea contain the traditional text of Matthew 28:19. However, that is not as shocking as it sounds, and this fact in no way undermines the reliability of the traditional text. The fact is that we have no extant pre-Nicene Greek manuscripts of Matthew containing Matthew 28:19 at all. We have pre-Nicene Greek papyri fragments covering about a fifth of the Gospel of Matthew. Matthew 28:19 just happens to be one of the passages not among the extant papyri. There is an easy to understand reason why: Matthew 28:19 comes at the very end of the Gospel. Papyrus manuscripts were highly fragile, and it was common for them to be damaged especially at the beginning and end. This is why, for example, there are Greek manuscripts of Matthew that end earlier in Matthew 28, just a few verses from the end: the last page was lost or highly damaged. ALL of the extant Greek NT manuscripts that have Matthew 28:19 have the traditional wording. There is no exception. The earliest extant Greek manuscripts containing Matthew 28:19 date from the fourth and early fifth centuries. One notable fact about these manuscripts is that they represent three different textual “families” or scribal traditions, conventionally known as the Alexandrian, Byzantine, and Western text types. This includes Sinaiticus (א) and Vaticanus (Alexandrian text type), dated 325-360, Alexandrinus (which, despite its name, is Byzantine in type in the Gospels), dated ca. 375-450, Washingtonianus, another Byzantine text dated about 400, and Bezae, a Western-type text also dated about 400. We also have manuscripts of the NT in Coptic and Latin containing Matthew 28:19 that date from the fourth century. These manuscripts, especially one of the Coptic texts, attest to an independent scribal tradition of translation from before Nicaea. They confirm that the traditional text of Matthew 28:19 is correct. If the anti-Trinitarians were right, it would mean that the correct wording of Matthew 28:19 was not preserved in a single ancient manuscript in Greek or in any of the languages into which the NT was translated. That claim requires a conspiracy theory to work, but such a conspiracy theory simply doesn’t fit the facts. When Eusebius quotes Matthew 28:19 without the three names Father, Son, and Holy Spirit, he also omits the words “baptizing them,” and only sometimes includes the words “in my name.” It is evident from a careful study of his quotations generally that weight should not be put on his exact wording. That there was no conspiracy involved is proved by the fact that Eusebius sometimes uses the full quotation with the three names and sometimes his shorter version even in the same writing! Finally, Shawn claimed that no one before Nicaea quoted Matthew 28:19 in its traditional form. That was simply false. The traditional form is attested in the Didache (ca. 80-120), Justin Martyr’s First Apology (155-57), and Tertullian’s On Baptism (ca. 200), to name just three texts dating not only before Nicaea but within about a century of the NT writings. It is very sad to see Shawn repeating such distortions of the facts of Scripture to support his rejection of the Trinity. NOTE: As excellent as Mr. Bowman’s statement is on it’s own, the reader is strongly encouraged to use the link to the original post and consider the equally superb comments that others – many whom are Theological Heavyweights – added beneath his statement. I think the reader will find them to be a wealth of wisdom as well as instructive and enlightening. Presbyterian Pastor Jason Wallace gives a superb overview of Shawn McCraney’s slide into heresy, rebellion, and error on his “The Ancient Paths” television show. He very rightly identifies Shawn’s methods and teachings as nothing more than a modern, repackaged form of of Mormon-style Restorationism combined with Christian Gnosticism. Calvin demonstrates how Gnostic dualism works – or, in this case, doesn’t work. 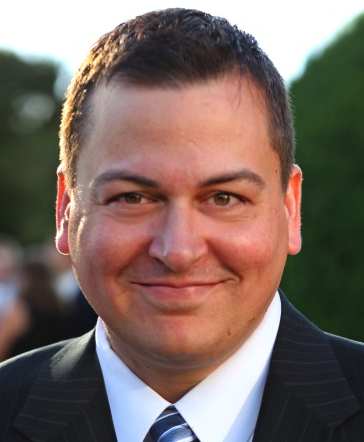 Jason Wallace appears on a special two hour edition of Heart of the Matter that features a moderated debate between he and Shawn McCraney. The event descends into chaos (some later referred to it as “a circus” others “a Soap Opera”) when the moderator allows members of Shawn’s family (his wife and daughter), known instigators (like CAMPUS member Jed), and rank and file Shawnites to confront and denounce Mr. Wallace rather than the type of questions appropriate to a formal debate setting. Further, the moderator (who is supposed to maintain neutral during debate proceedings) gave a supportive hug to Shawn McCraney’s wife immediately after she had ripped into Jason Wallace and allowed her to whisper something in his ear – all this while the debate was continuing right in front of them. This can hardly be described as neutral behavior. To make matters worse, this “neutral” moderator also made comments (some of them snide) in support of Shawn’s position during the closing moments of the debate. Thus the general consensus of those outside of Shawn’s camp is that Mr. McCraney and his followers acted very inappropriately – even cult-like – during this event. Shawn McCraney takes the entire broadcast to debrief on the February 3rd debate and address what he sees as the key issues that came up. Most surprising is his assertion that the apex of the event were the very things that in the days following most people pointed to as the low points, specifically: Loose cannon, pot stirring, Shawnite Jed asking Jason Wallace if he loved him, and Shawn’s wife and daughter dressing down Jason Wallace before a worldwide audience [@09:10-12:00]. Also surprising is Shawn’s claim that he’s mentally ill [@38:47], that’s he’s proud of it, and that the world would be a better place if it would appreciate mentally ill people (like him) and their unique way of seeing things rather than trying to get them to conform to normalcy [@33:30-41:10]. 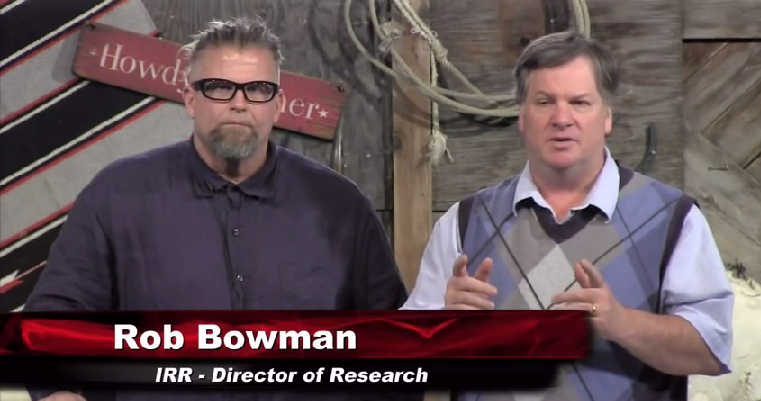 Pastor Jason Wallace is joined by Pastor Curtis Eggelston (of Berean Orthodox Presbyterian Church in Ogden, Utah) on his Ancient Paths television show to debrief on the February 3rd debate and analyze Shawn McCraney’s teachings and practices. Last night’s episode of The Ancient Paths is now available on YouTube. Curtis Eggleston and I started our review of what was said in my exchange with Shawn McCraney. The main focus was on Shawn insisting on labeling me a Calvinist. He pushed me to accept the label at “The Inquisition” a year ago, then again in “The Confrontation” two weeks ago. His wife shoved a microphone in my face demanding I answer “yes or no” whether I am a Calvinist. All through “The Confrontation” Calvin and Calvinism were mentioned by Shawn. In Shawn’s show the following week, he described me as having “an absolute allegiance to Calvinism.” Why does Shawn, who hates being labeled, insist on labeling me a Calvinist? Why was I hesitant to embrace his label? I believe if you look at what Shawn has publicly taught about Calvinism, it all makes sense. First, let me say, I don’t like the label, because it gives the impression I am following John Calvin instead of Jesus. At the same time, though Shawn twists things, the essence of what he insists on calling Calvinism is just biblical Christianity. It was taught by Calvin, but also by Martin Luther and all the Protestant reformers. It was taught by Augustine and a host of others throughout the early church. It is the faith of Jonathan Edwards & George Whitefield (leaders of the Great Awakening), Charles Spurgeon, William Carey (founder of the modern missions movement), David Livingston, and a host of more modern saints. Shawn dedicated seven shows to Calvinism in 2013. In his show from October 1, 2013, he told a caller. . .
Now let me offset what you’re saying to me with what you believe, which is that God sovereignly creates men and women to burn in Hell. That that is His sovereignty – – that He has them and let’s them live here, but it’s His joy to have them burn in Hell while His other chosen ones get to live in bliss. And He knew that before creating one single person. If you want to follow that God, have at it, but not me. Shawn cannot reconcile God being love with God knowing people will go to an eternal Hell, so Shawn portrays such a God as a sadistic monster. Dale Finley, an Arminian Baptist pastor, called in to say this is not a Calvinist/Arminian issue, but that Shawn has rejected the God of the Bible in his teaching. Shawn explicitly says he will not follow a sovereign God who sends people to an eternal Hell. Please be clear, our purpose is not to judge Shawn’s heart, but to respond to his public teaching and speak the truth against his errors. Shawn said at “The Confrontation” that we were arguing over “the color of God’s eyes,” but it is clear the issues are the most fundamental in the faith. I called Pastor Jason Wallace last week and asked him a simple question – Are we done? (meaning,“Are we done with all this between us?”). I couldn’t help but say, “Praise God” and felt our time together was not in vain . . . that just maybe I could accept Jason as a brother and he might see me as the same – even though we do not agree with one another. I was then informed that last week my brother announced on his program that he in fact going to continue to pursue me on future shows – this time with another Orthodox pastor. I accept Jason as a brother and think he sincerely believes he is going God’s will. And I will refrain from ever criticizing Jason or any other brother directly (or in public) but will ardently strive to see them as meaning well. . . and let God be their judge for the good and evil they may do. I believe in order for subjective Christianity to be seen as viable it has to be lived. And it has to start somewhere. Pastor Jason Wallace is again joined by Pastor Curtis Eggelston on his Ancient Paths television program to finish up their debriefing on the February 3rd debate. Among other things, they tackle Jed’s agenda driven, pot stirring, “do you love me?” tactic (and it’s resulting fall out) from the debate head on. The reader will find this at 13-minutes and 10-seconds into the broadcast. Those interested will also find a fuller analysis of Shawnite Jed’s continuing pattern of public manipulation and grandstanding in part 5 of this series. Many former Mormons have escaped the institution, but not the mindset of Mormonism. All their lives, they have been fed stories of how bad other churches are. Protestant pastors have been caricatured at the Mormon Miracle Pageant and in endless stories they have heard from their youth. After years of being told all other churches are wrong, many LDS simply add Mormonism to the list of false churches and embrace atheism. They abandon the claims of the LDS church to truth, but they blindly accept all its criticisms of the Bible and other churches as true. They breathe out contempt for Christianity with the old fervor of Brigham Young and Parley Pratt. Though the vast majority of those who abandon Mormonism try to convince themselves there is no God, some recognize that they cannot escape His reality. They see the foolishness of an atheism that pretends to find meaning and value in a world devoid of purpose. They instead read the Bible and see an explanation for the world before them. Man is capable of greatness and perversity – – Bach and Hitler, DaVinci and Stalin. They discover that the world was created good, but it has been corrupted through sin. In that same Bible, they find the one who has come to undo the Fall of man and reconcile sinful men to a holy God – – Jesus Christ. They hear His words and recognize their truth. The problem is that all too often, they do not recognize that they still carry with them the prejudices that were inculcated in them from youth. They view the Bible, Jesus, and His church through “Mormon glasses.” It is into this confusion that Shawn McCraney has stepped. He has been the instrument of helping many people see the errors of Mormonism, but in its place he is teaching a Jesus who plays to these prejudices, but is not the Jesus of the Bible. Shawn McCraney is a passionate and charismatic man. These traits led to him being thrust into public ministry with very little experience. He has publicly stated that he had only attended five Evangelical worship services in his life before being offered an Evangelical television ministry. He had never even been baptized outside the Mormon church. Evangelicalism’s fascination with “star converts” pushed Shawn into the spotlight without proper preparation. His denunciations of Mormonism and promotion of a vague “personal relationship” with Jesus was considered orthodox enough for his promoters. Despite Shawn’s rejection of many of the trappings of Mormonism, he has kept much of what made it popular in its founding. The early LDS made people feel pious in their contempt of educated pastors. Instead of “theology,” the LDS claimed to offer direct, personal experiences of God. Christianity was presented as a dark chaos of conflicting opinions. Something new was needed that would unite everyone. The Bible was appealed to, but was subject to what they considered the direct witness of the Spirit. This allowed them to ignore what they wanted from the Bible, while using it to attack their critics. In place of “doctrines of men,” the Mormons offered a vague, personal spirituality and a community that did not make the traditional demands upon them. Over time, Mormonism’s demands became much higher, but they were not so high in the beginning. I named this review “McCraney-ism” because Shawn seeks to dismiss everyone who has gone before him as holding to an “-ism” or being an “-ist.” He, on the other hand, rejects all labels. This allows him to savage others’ beliefs, but then claim he is only attacking the “-ism.” When someone challenges his public teachings, he claims they are attacking “his person.” The reality is that Shawn is promoting a system of doctrine, an “-ism,” as much as anyone else. Shawn dismisses everyone else’s interpretation of the Bible as the “doctrines of men,” while he is just “sharing” what he sees. This plays to the prejudices of former Mormons and others who feel burned by “traditional” churches, but it is misleading. In a recent episode, Shawn asked, “. . . who do I think I am that I could actually spit in the wind of 1800 years plus of religious tradition and biblical scholars and learned men and women and suggest that they have been misled in the way they have applied the Bible to doing Christian life? I don’t know who I am when it comes to this. I might be crazy. I might be a fool. I might be inspired. I’m not sure. But I can say this is how it comes together for me. This is how when I sit down and read it, this is what speaks to me, and I’m going to be true to that. If I’m crazy, discover that and don’t listen to me, If I’m wrong in spots, you can call me out on it and go on and love me, or you can choose to fight it. But just understand I pray to God that it’s from Him and not Satan, who gives me the perspectives, and sometimes I don’t know . . .” This is disarming on the surface, but if heaven and hell are at stake, would he still be teaching others if he wasn’t convinced what he was saying was true? Shawn claims he’s “wrong 90% of the time,” but that doesn’t stop him from denouncing what the Bible teaches and demonizing churches and pastors. It also doesn’t stop him from demonizing the attempts of his critics to specify those errors. Shawn claims all his critics care about is doctrine, but he cares about love and people. When I appeared on Heart of the Matter, one of his group asked “how many of you here love me,” I didn’t raise my hand. Since the immediate context was Shawn asking if I counted him as a Christian brother, I understood the question in that context and did not raise my hand since I did not really know the man. This was immediately interpreted in the worst possible light and Shawn later claimed that I choose not to love people. He says he thinks it’s unbiblical, but he “respects” my right to do so. I have tried to make clear that I love my neighbors and even my enemies, but I do not love them in the same way I love those of the household of faith. Love is more than a warm, fuzzy feeling for all people everywhere. I show love even to those who mock everything I stand for, including Shawn. I tried to correct him privately over 7 years ago. I have prayed for him for years. I have repeatedly tried to respond fairly and in love to Shawn’s denunciations. I have tried to speak the truth in love, but all that some of his group can see is hate when any criticisms are offered. Their own hatred of their critics seems to escape them. What makes others’ interpretation of the Bible better than Shawn’s? The Bible is not unclear, and Shawn stands against the united witness of nearly 2,000 years of Christians on basic issues. Many of these Christians, unlike Shawn, could read the Bible in its original languages. These Christians also allow the Bible to interpret the Bible; they don’t impose a meaning on the texts that allows them to ignore passages that contradict them. They don’t let their conception of the love of God trump clear teachings about the wrath of God. Shawn seems to realize the Bible does not really support some of his new teachings, so he is attacking the inerrancy of the Bible as “crazy.” He is pitting the subjective testimony of the Spirit in you against the objective witness in the Bible. For those who recognized that a burning in their bosom was no assurance of truth, this should be troubling. The Holy Spirit is the author of the Scriptures and cannot contradict them. Why does all this matter? First, Shawn is presenting a different Jesus. He has stated that the Lake of Fire is in the presence of Jesus, so unless Jesus has some sadistic pleasure in torturing people, sinners must be ultimately reconciled to Him. He ignores that in Revelation 14, those who receive the Mark of the Beast are tormented “in the presence of the holy angels and of the Lamb, and the smoke of their torment goes up forever and ever.” Shawn says he will not follow a God who creates people He knows are going to an eternal Hell. Since this is the only God seen in Scripture by Calvinists, Arminians, Catholics, Orthodox, and practically everyone in church history, this should be seen as a problem. Shawn has taken the truth that God is love and used it to undermine anything that does not fit his idea of love. The Jesus that Shawn presents is also a failure. His Holy Spirit apparently failed to lead the church into truth until now. His Second Coming in 70 A.D. (according to Shawn) failed to end the curse or to crush the head of the serpent. Shawn leaves open a “third coming,” but says there’s nothing about it in the Bible. Shawn’s Jesus also fails to resurrect our physical bodies, which makes Acts 17 and 1 Corinthians 15 nonsensical. Second, Shawn is giving false assurance to unbelievers. He tells them if they have a “personal relationship” with Jesus they’re right with Him, and if they’re wrong, Hell is only temporary. Jesus does offer us a personal relationship, but He also warns us of those who draw near to Him with their lips while their hearts are far from Him. Shawn does not answer the warnings in 1 Corinthians 6 and Galatians 5 of those who profess faith but exhibit sins that show their hearts are unchanged. Jesus indwells His people. They are not free from sin in this life, but there are sins from which they are freed. Shawn uses James 2:10 to dismiss the clear teaching of 1 Corinthians 6 and Galatians 5. All sins are worthy of Hell, but there are sins, such as the continued practice of homosexuality, that demonstrate someone has been given over by God to a reprobate mind (Romans 1:24). Finally, Shawn is robbing Christians of the means God has appointed for their edification. There are churches out there that are no better than the Mormon church, but that does not mean there are none who tremble at God’s Word. As Joseph Smith before him, Shawn tends to paint all churches with the same brush to confuse and frustrate people, so that he can offer an alternative. He plays on the divisions to make people give up on the idea of finding a true church. The irony is that most of these divisions are the work of others like him. We need more than the community Shawn offers. Shawn says no one can tell someone else they are in sin, because if we’re going to talk righteousness, “you damn well better be righteous.” This is not what Jesus commanded. He established a visible church and said if a professing Christian would not hear it, they were to treated as “a heathen and a tax collector.” This does not mean they are hated, but that they are prayed for and called to repentance. Our Lord, through the Apostle Paul, commands his church to judge a man who married his father’s wife and not to eat with him as a brother in Christ. This was an expression of love that Shawn rejects, and it led to his repentance and restoration. Many former Mormons tend to view any accountability in the context of how they have been abused. Biblical elders are commanded not to lord themselves over the congregation; they are to be the servants of all. They are warned they will have to give account to God (Hebrews 13:17) for having kept watch over His people. The Apostle Paul called out Hymenaeus, Alexander the Coppersmith, and a host of others by name for their errors. Shawn is presenting a different Jesus and a different gospel. My plea to you is to be like the Bereans (Acts 17:11) and search the Scriptures for yourself. Brigham Young made the invitation, because he knew most people wouldn’t really test what he was telling them. I plead with you to read the Bible for yourself. It is not enough to be against Mormonism. It is not enough to substitute new lies for old. It is not enough to claim a personal relationship with Jesus while refusing to do the most basic things he tells us. In the pages of God’s Word, you will find the truths rejected by Joseph Smith and Shawn McCraney, but embraced by countless saints who sealed their faith with their blood. You will find a Jesus far more glorious, and a gospel far more awesome. You will find the faith once for all delivered to the saints. There is a small movement afoot that is seeking to categorize me and my beliefs as an offshoot of Mormonism. These Christian brothers have gone so far as to take Joseph Smith’s claims and assign them to me. The longer I live the more readily I believe that we will always see and hear and believe what we want to see, and hear and believe, and it takes a real effort to remain in truth. In any case it seems that this is intended to remove me and what I teach from Christianity by attempting to categorize me as an offshoot of Mormonism rather than an accepted brother in Christ. The similarities I have with the views of Joseph Smith are not limited to Smith. Anyone who is frustrated with church history, creedal Christianity, or man’s interference into the subjective relationship people have with God through Christ share Smith’s frustration. Do such frustrations make me a Mormon? Common. But in the name of clarity I personally renounce Mormonism as a counterfeit gospel. This includes everything that makes it distinct including its priesthoods, its temples, its extra biblical books, its views on God (or God head) and the ontology of God, its soteriology, its baptisms . . . I mean, I really share nothing with Mormon doctrine and little with their practices. Turning the tables, I have almost everything in common with Bible believing Christians. Jesus is God in flesh – the Word uncreated. The Holy Spirit as God in spirit. The Bible is His trusted Word. Jesus is the only way, truth and life. He is the author AND finisher of the faith. The importance of love in believers. But because I disagree with two non-essentials (eternal punishment and the dating of Christ’s return) and one element some claim is an essential (the term and definition of the Trinity) some have tried to literally push me out of Christianity (the faith I embrace and love) and back into a schism of Mormonism (the faith I renounce). Like I said to the LDS, if you don’t accept my views on eternal punishment PROVE THEM WRONG. If you don’t agree with my Preterest Stance PROVE THEM WRONG. Same with the Trinity. But stop the infighting. Accept my apologies, my differences, and try to see what we are doing and why. Heretic! Rebel! A thing to flout. He misrepresented the arguments that are being leveled at he and the McCraneyism movement. He failed to address the substance of those arguments. His statement, “Jesus is God in flesh – the Word uncreated” is too broad and general to be accepted as fully “orthodox”. As worded, this confession could refer to the heretical modalism that McCraney teaches, a number of other heretical stances on the nature of God, and/or biblically orthodox Christology. In summary, it fails because of its imprecision. His statement “The Holy Spirit as God in spirit” is skewed to the heretical – especially given the fact that he has taught on the Holy Spirit as an “it” or a “force” rather than a person. He has never apologized for or renounced the content of his heretical teachings, merely the delivery. The errors of his teachings have been addressed from the Bible on this website and elsewhere many, many, many times yet he continues to hold to and teach them. The problem isn’t that his error hasn’t been exposed and addressed from the Bible, the problem is that Mr. Craney refuses to listen. Other all, this statement was the same kind of spin doctored, obfuscation that we see from the LdS Church and other Mormon splinter groups. Further, as noted, Mr. McCraney engaged in the classic Mormon tactic of using Christian terminology but changing the underlying meaning. There is, therefore, no need to withdraw the charge. In fact, Mr. McCraney’s statement actually confirmed it’s validity and veracity. Respected Mormon researcher and critic Bill McKeever offers his assessment of Shawn McCraney and the McCraneyism movement on the The Eternal Planner w/ Rob Rennie radio show. In his assessment he also gives some of the local history that pre-dates Mr. McCraney’s pre-heresy days. This historical perspective may be enlightening to those who were outside of the Evangelical Christian community in Utah (or those who were in it but not “in the know”) while it was occurring. Shawn McCraney’s October 6th, 2015 response to this critique can be found below. Shawn, as usual answered [Slick’s solid presentation] with his mocking exasperation argument where he cites a few random verses out of context and then mostly ends up citing himself as the authority, saying things like, “it doesn’t make sense”, “I don’t see how” while straw-manning various supposed Reformed propositions. I’ve heard his complaints (against the God of the Bible/”the God of Calvinism”) many, many times before–it’s the same old rant. . . . From atheists . . . humanists . . . wiccans . . . feminists . . . militant homosexuals . . . agnostics . . .. pagans . . . universalists . . . Satanists . . . and any number of God-hating, man-exalting unbelievers. “What kind of God sends people He created to Hell? !” is basically it. . . . Which is why I’m not so sure Shawn IS a “brother” in Christ . . . as so many who’ve tried to reach him . . . seem so reticent to clarify. He is a likable, humorous, charismatic guy . . . and I know it is not a small thing to call someone a heretic or, worse, a “wolf” among the flock . . . but I’m beginning to wonder what is the difference between Shawn’s Jesus and the Mormon or Jehovah’s Witness or New Age Jesus? Okay, the details are different . . . but in the end IT’S A DIFFERENT JESUS just the same. Why do “we” say that Mormons or JW’s or Catholics “aren’t Christian” even though they claim to believe in “Jesus”? Well, how is what Shawn is doing any different? Not because of his rejection of Reformed theology . . . but because of the leaning aggregate of all his errant assertions: “The doctrine of the Trinity is garbage”, . . . “the 2nd Coming has already happened” . . . “Christianity is totally subjective” . . . “Everyone will ultimately be saved/there is no eternal damnation” . . . “The Bible isn’t really relevant for us today–it was written by and for those prior to 70 A.D.” . . . “you can lose your salvation” and so on. . . . If God is the author of the Bible, and Jesus is God . . . and Shawn teaches a growing body of doctrines that contradict orthodox Christian belief–at what point is he no longer believing and teaching “Christianity” . . . but something else instead, just as we say the cults and heretics do? “Modalism, also called Sabellianism, is the unorthodox belief that God is one person who has revealed himself in three forms or modes in contrast to the Trinitarian doctrine where God is one being eternally existing in three persons. According to Modalism, during the incarnation, Jesus was simply God acting in one mode or role, and the Holy Spirit at Pentecost was God acting in a different mode. Thus, God does not exist as the Father, Son, and Holy Spirit at the same time. Rather, He is one person and has merely manifested himself in these three modes at various times. Modalism thus denies the basic distinctiveness and coexistence of the three persons of the Trinity. So let’s be clear here: Despite, the spin doctoring, well poisoning, and posturing that he engaged in before and after this announcement, this is the equivalent of Mr. McCraney appearing before a worldwide audience and publicly announcing, “I am a committed Christian heretic”. “He [Shawn McCraney] sets up a straw man for what it means for him to live the virtue of submission, as though that means abandoning all the idiosyncratic ideas of his own for ministry. It’s about being in a community of discipleship and accountability. Shawn should humble himself and participate in a local church with qualified elders. “Whoever isolates himself seeks his own desire; he breaks out against all sound judgment.” (Proverbs 18:1) Submission to others is a Christian virtue for all believers. He misrepresents the controversy over “Born Again Mormon” as if whether there are born again Christians within Mormonism. At this point, he arrogantly and mockingly misrepresents Bill McKeever’s concerns. The real controversy was whether such born again Christians should be counseled to leave the LDS Church. Honest and forthright discipleship should encourage any believer to get into a healthy Bible-believing church. At least in his video, he failed to distinguish his universalism from Rob Bell’s universalism. It’s hard to see why he was refuting McKeever’s description. “I never said that.” But you didn’t have to. The issue wasn’t whether you explicitly aligned yourself, by name, with Rob Bell’s position on hell / universalism. But the issue was whether Bell’s universalism was a fitting analogy for your own. Further, Mr. McCraney’s representation of the historical facts regarding him being challenged, confronted, and corrected regarding the descent into heresy that he started down in 2013 are flat out wrong. This can easily be proven because the “The Trial(s) of Shawn McCraney” series of articles on Beggar’s Bread (of which you’re currently reading Part 4) has been documenting this descent as it has been occurring – that is, in the historical moment and with supporting evidence. One need only start at the beginning of this series and start reading, watching, and listening to see how badly Shawn McCraney’s HOTM episode 466 recitation abused and misrepresented historical reality. Simply put, the body of evidence just doesn’t match Mr. McCraney’s spin doctored, revisionist “facts”. Instead, Mr. McCraney simply cancels the interview. As as a result of these events “Christian Utah” schedules Jason Wallace as a replacement and they spend about half the show discussing the history of Shawn McCraney’s slide into heresy and error and the other half discussing the unique culture of Mormonism (in general) and Utah (in particular) that lends itself to the type of Christian antinomianism taught and practiced by Shawn McCraney as well as so many others in the state. This show is also a superb primer for those who want to get up to speed quickly on the history of Shawn McCraney in Utah, the Shawnites, and McCraneyism as it stood as of that date. Click here to listen to this show. Shawn and Matt come together for a dialogue about orthodoxy and Shawn’s refusal to fully embrace it. They see things very differently relative to a number of teachings and doctrines in the Christian faith. Shawn is convinced that modern Christianity has misappropriated the Bible and assigned to it power and authority that was never intended to have from the start of the faith. 4) Modern material religion is actually unnecessary and quite inconsequential. Shawn and Matt will compare several Christian topics to see how vital they really are to a person being viewed as a true Christian, to salvation, and to being received in the Body. It’s hard to summarize something this loose, sloppy, disjointed, and chaotic into a few sentences. That said, the general consensus after it aired was that this event clearly demonstrated how unfit Shawn McCraney is to teach anyone anything. Plainly stated, every time Shawn spoke during this event it simply demonstrated his incompetence, irrationality, ignorance, pugnaciousness, lack of self control, and, most importantly, inability to engage in sound biblical hermenuetics. As Matt Slick said so well at the 1:34:20 mark, “So much heresy, so little time.” However, that said, it wasn’t Mike Slick who exposed Shawn McCraney as a heretic in this broadcast, Mr. McCraney did a wonderful job of doing that himself. In the end this broadcast made it abundantly clear that to watch to Shawn McCraney teach is to see a fool in his folly. If you doubt this simply watch the show. By “Tag Team McCraney” I’m referred to the practice of Shawn McCraney and the members of his family “tag teaming” his guests with emotion-laden personal attacks and appeals in front of the cameras. And here is Tag Team McCraney’s dogpiling of Matt Slick on his October 2016 appearance – a dog pile that results in Matt Slick storming off stage. As of this writing, Matt Slick has yet to appear on Shawn McCraney’s program again. Oddly, this behavior – which common decency and decorum would stop most people from even considering, let alone engaging in – seems to be no problem for Tag Team McCraney. And it needs to stop. Christian Scholar, Apologist, and Theologian appears on the newly dubbed “HOTM 2.0” program to address Shawn McCraney’s avowed modalism. The HOTM production team, in their typical over the top, hyperbolic manner, dubs this event “Showdown 2018”. During the show Mr. McCraney demonstrates such inconsistency and vacillation that James White ultimately dubs him a “walking contradiction” to his face and in front of the cameras. Further, as they have done in past debates, Mr. McCraney and his production team do everything that they can to skew the playing field to his advantage – including frequent breaks whenever James White drove his point to a crescendo and asked Mr. McCraney to respond. During these breaks, the glories of McCraneyism were advertised via commercials for the movement’s products and programs. In the end, it’s clear from Mr. McCraney’s pre-recorded closing statement that he didn’t approach his discussion with Dr. White with an open mind and went into it with no intention of reconsidering anything based on it. Many people consider this program one of the best evidences of how and why Mr. Craney is clearly unfit for Christian leadership. James White does a very brief analysis of “Showdown 2018” focusing on Mr. McCraney’s inconsistent and confused theology. This is my goodbye to the group. I have sought to warn those who follow Shawn McCraney that he is a false teacher who is leading you away from real Jesus in much the same way the Mormons do. He plays off the pain and prejudices of former Mormons to lead them into what he calls freedom, but what the God says in the Bible is just another form of slavery. Back in the Fall, Shawn called me out twice by name on The Heart of the Matter. He called me a coward and said I wouldn’t dare defend my beliefs. I quickly said I would defend the Trinity, the Second Coming, or anything else he was attacking. Having put me off and then trying to shift the issues, Shawn now says he doesn’t want me on at all. I am honestly relieved, not because I would have a problem showing the gross errors of preterism, but because I have better things to do. I am tired of Shawn’s games. I am tired of someone who talks so much about love lying about me, claiming I want to kill him and burn him at the stake, twisting my words and mocking me. I’m tired of Shawn calling the God I see in the Bible “a monster,” but then being told I’m unloving if I respond in any way. I honestly have more hope for Mormons to hear what the Bible says than those who still follow Shawn. My plea is not to take my word, James White’s word, or Shawn’s word, but read the Bible and pray that God will show you the truth. I won’t rehash all the warnings I’ve given in the past. If anyone has questions, they can PM me or call me. I believe to anyone honestly listening, Tuesday night made clear that Shawn is making up his own religion that frees him from any accountability. If you continue to trust him over the clear teaching of the Bible, you will have no excuse in the day of judgment. My hands are clean (Acts 20:26-27). I will leave you with the warning of Jesus. . . The week following “Showdown 2018”, Mr. McCraney debriefs his followers on the weekly HOTM 2.0 broadcast. The message, in a nutshell, is a familiar one: Shawn McCraney and his followers should be able to believe and teach whatever they want and call it Christianity. Period. No if’s. No and’s. No but’s. And no one has the right to say – or even suggest – otherwise. James White gives a second debriefing on “Showdown 2018” focusing on how Shawn McCraney’s modalism not only destroys any possibility of developing a fully formed theology but actually destroys the gospel as it’s revealed in the Bible, resulting in another gospel. A bishop must be blameless, as a steward of God, not self-willed, not quick-tempered, not given to wine, not violent, not greedy for money, but hospitable, a lover of what is good, sober-minded, just, holy, self-controlled, holding fast the faithful word as he has been taught, that he may be able, by sound doctrine, both to exhort and convict those who contradict. “What is so sad and so very troubling is not that Shawn is wrong, but that he is not listening. We have all been wrong in our lives, those of us who were Mormons at one time have been very wrong, but we have all had to start along that road of correction by listening, by being humble, teachable, open to the love, care and experience of others. Heart of the Matter Episode #394 (see https://www.youtube.com/watch?v=HLx7hWk3s4E ) wasn’t added to this timeline because it focused on LdS soteriology – a subject outside the scope of our focus here. However, prior to the lecture Shawn asserted that his Christian critics engage in the same type of tactics that his Mormon critics do – only criticizing his mistakes and not recognizing the truth of, and things that he gets right in, his lectures. He also explained that he realizes that he’s going to get far more things wrong than right – even going so far as to say that, in his opinion, if he only gets 10% of it right he’s “doing well”. After reading that timeline* I would ask the reader to determine for him or herself whether Shawn’s assertions regarding his critics methods and tactics are valid or not. Shawn also asked why his critics don’t talk about the “truth” that can be found in his lectures. This presupposes that truth CAN be found in his lectures. In reality, most of Shawn’s lectures are so filled with fallacious reasoning, contradictions (often he’ll contradict himself in the same lecture – I can cite many example of this), bad hermeneutics, disorganized thinking, ignorance of the subject, and sloppy scholarship that cogent, discernible truth is hard (and at times impossible) to find in them. I must also point out that if Shawn is only right 10% of the time then he’s wrong 90% of the time – IMO, that’s hardly, “doing well” as he claimed in this show. In fact, it raises the of question why someone who would consider such a high failure rate is acceptable feels qualified to be publicly teaching Christian doctrine to a worldwide audience at all. 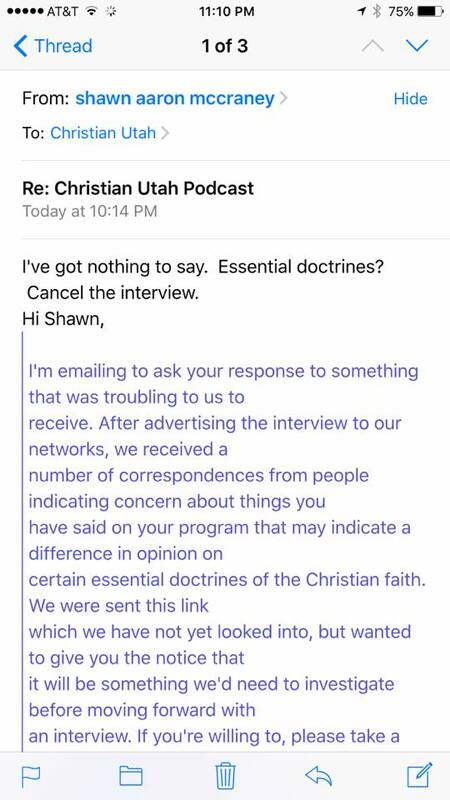 I would respectfully ask Shawn to reconsider his low standards for accuracy in his teaching and I would respectfully ask his followers to ask themselves if receiving doctrine from someone with such low standards makes sense. After all, the stakes are high here! We are all given only one life to steward and we steward it through the choices we make. Choose wisely. The title of this post is a bit of a misnomer. It should be, perhaps, The Bible vs. Shawn McCraney. And this really is “the heart of the matter”. . . .
Local Pastor Jason Wallace of Christ Presbyterian Church was invited by Shawn McCraney of Heart Of The Matter podcast . . . to a sort of 2-hour debate, contention. Shawn has been teaching a slew of controversial doctrines for the past year or so and Pastor Wallace has been his most public, local critic. Shawn was irked that Wallace has sometimes played clips from Heart Of The Matter podcasts on his own show “Ancient Paths” and finally challenged Wallace to meet in person to hash out some of the issues. I make the point regarding the title above . . . to say that what is obvious and at the crux of the matter–and what Shawn simply seems unable to see . . . is that Shawn is merely defending his own personal, subjective opinions and speculations . . . while Jason is defending the fundamental truths of Biblical Christianity. Jason argued from scripture, never “attacking” Shawn’s character or person, but just the errors he has been teaching. I don’t recall him ever “mocking” Shawn on his “Ancient Path’s” program as charged by the McCraney’s . . . but there was Shawn through the whole debate, mocking, sighing, making snide comments, making fun of Jason’s person, making faces, rustling papers during Jason’s time to speak and on and on. Shawn admits he has never watched Jason’s show, yet he accuses him for its content. . . . The bottom line of the whole thing is that Shawn wants to be able to teach whatever he feels like at any given moment, call it “real” Christianity . . . and never have to answer for it. How is this different than what New Agers . . . or Muslims . . . or Hindus . . . or cultists claim, when they use Jesus and certain parts of the Bible in their own false doctrines asserting that THEY have true angle on things. Is there actually a TRUTH to be had? According to Shawn, not really, it’s all “subjective”. But this is precisely what separates Biblical Christianity from all other religions. There IS objective truth to seek AND TO FINALLY FIND. There is a truth to proclaim and defend. We are called to confront error and false teaching, as uncomfortable and misunderstood as it usually proves to be. A frustrating part is that Shawn seems to think he has discovered a new twist–almost something like a “new revelation” of what the Gospel of Jesus Christ actually is. When what it appears to be is that he is managing to find every basic, knee-jerk heresy that has sprung from the foundation of the Church to present times, and touting it a new discovery. His questions on the Trinity, eschatology, church discipline, the role of scripture . . . have already been dealt with, many times over. There IS a truth to be found. By definition, the “truth” is objective, real; once found it is to be held on to, promoted and defended. That is all that Jason is doing, as he is called, being a “handler” of the Word of God, responsible for the sheparding of souls. Shawn is but promoting and defending himself, his ideas, his subjective opinion on what may or may not be the truth. He mocks, he sneers, he chides, he tears down, he assaults . . . then cries, “it’s all only about ‘love'”! Then reacts in outrage when anybody, especially an ordained Pastor of the church, answers or contests his views. Matt Slick came down to SLC to debate Shawn McCraney again, this time over a number of issues but especially the Trinity. Watching the to and fro again it strikes me how . . . really it must be the Spirit that makes it so you can see the Truth. Otherwise you are just left to your own subjective opinions and ideas, whims. The foundation to everything is starting out UNDER God’s sovereignty. How does HE say it is in the first place? What did He establish in His Word? Whether I like it or not intellectually or emotionally . . . it is the way it is and it is only up to me to submit or not. And even THAT is in His control. But where Shawn and so many others go off the rails is that they start, not with God as sovereign, but with themselves as the judge. He can’t imagine a God, ie., that would eternally punish people. Or that God chooses who He will for salvation–it’s not up to the creature. It doesn’t seem “fair”, “loving” . . . according to SHAWN’S sentiments. If it doesn’t fit Shawn’s subjective opinion then he sets about finding a way to reinterpret it and concocting theories so that it does. Once you do that, you are totally un-moored from objective Truth and now just operating in pure speculation, fantasy, hopes, fears, dreams. You make a God in your own image and worship that. Which is a disaster. It is the source of ear-tickling preachers, teachers, promoters. You become a “guru” and collect like-minded followers who also don’t like God as He Is. And all go over the cliff together. So ominous, so dangerous. And truly, this is where the Truth, rather than being oppressive . . . sets you free. No longer are you there vying and arguing with Reality, with God, always at odds. Now you are in His will and, since HE ALONE is totally free, you share in His freedom. He is at the wheel. He is in charge. You are merely an adoring, awe-struck, grateful servant.